Heavenly blog! : No. 1304: I am not opposed to child welfare, but I'm against that they take children from those who are competent, while ignoring those children who are neglected! No. 1304: I am not opposed to child welfare, but I'm against that they take children from those who are competent, while ignoring those children who are neglected! I am not opposed to child welfare, but I'm against that they take children from those who are competent, while ignoring those children who are neglected! Statistics indicating that the child does not attack those with addictions. But families who could have received aid, but deprives children so that they become even more traumatized and gets it even harder. In my article on child welfare, it has almost become a resurrection. Therefore, I come with this article, which explains my viewpoints regarding the child welfare! Acute location should be the last resort. Here it was just about the first thing they did to this family. Nasty case this CPS in Naustdal, elementary school these children went on and Naustdal municipality. We were treated by CPS bad, but Ruth and Marius Bodnariu even worse! When we won a crushing indictment against CPS at Karmøy in 2004, so they stopped the harassment and persecution. But for Ruth and Marius Bodnariu so it looks like it still? I wonder when they simply do not have one or, in this case good enough lawyers? I have now been running for two cases in court, where I 100% unlawfully persecuted by the authorities. Then you need than a good lawyer who can speak our cause, and who are able to put that here child protection in place. This one is even ongoing, with Jan Aage Torp. There we have a good hope of big change, for if the judgment stands it is Norway's greatest miscarriage of justice! In our case, in 2004 we had a killer lawyer, the late Gold Fire Kjos from Haugesund. He managed to put us in as good light, our children, what was the best for them. One thing that I remember he inbound explained it was not to split up families with children, this with a secure framework. That flock of children were grown up together, and that all research indicated that it was best for the children to grow up with their biological parents. + Many other things. When the verdict came, that everyone knew what was. Then stopped CPS up its harassment and we had already decided before this happened that we were moving back to Oslo. Therefore, it was enough Satan who walked in these welfare guys to prevent the will of God was going to happen ?! Good lawyer counts a lot in the face of child welfare, than that does not speak in favor of child protection. We took first contact with a 'star' lawyer in Haugesund, which I will not mention the name of. But he was too round for us / me, I wanted someone who could attack the child welfare system. For here is attack, the best defense! We need child care services - but not so the Norwegian child welfare work! When child welfare in Norway are doing so much wrong, but never being punished for something. 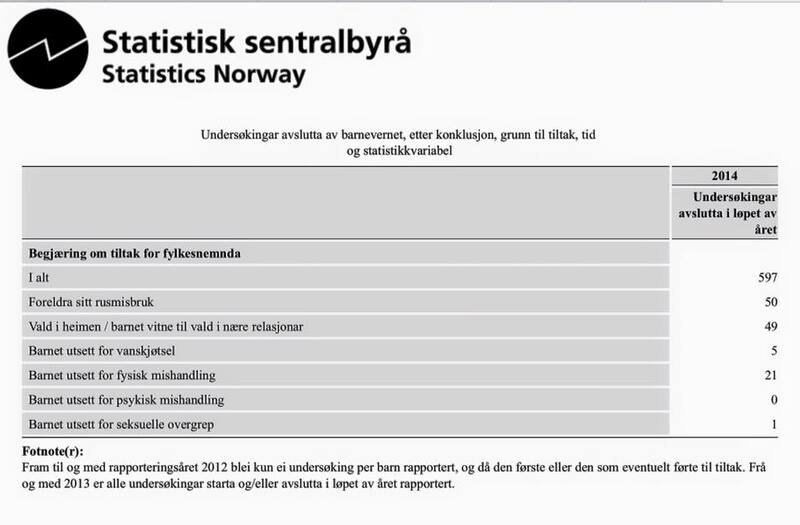 So it tells that child welfare is a state within a state Norway can operate freely, crazy and as they wish and will. In other words, it is a child who is not really under Norwegian law. And what ordinary people think and believe, it never reaches forward here. In other words, the Norwegian child welfare is overdue for liquidation in its current form. We need child care services where there is substance abuse and blatant violence inside the image. But anyway, immediately and emergency measures that they use. It's something that all too often makes matters worse and time after time in retrospect. Then there was exaggeration de lux! It is HUGE sad that bv does not help the children who need it! When they tie up their resources in homes where they are not needed, so they fail children they should have been there. We must put in place a serious agency that helps children who need it! (CPS wins in 98% of cases). The CPS is itself evil people - but they want you to be there! Actually, they are evil people many child welfare. So they say that you have failed in parenting, to place the children in foster care and others. Be it residential care and more. They attack the worst possible way with an emergency decisions behind the backs of parents. While dutifully at work, and the kids in kindergarten or school, they are extracted. Then they get the parents to "confess" and that they use against you for all it's worth. Here is råttenskapen and Satan operations in full bloom. Of course this is absolutely disgusting to do such a thing. What is the solution? The solution is above all to have a conversation with their parents, so the kids. So with parents and children together. Based on the so jobs further. Most parents can go in themselves, change and improve. If they hear that this is in their best interests and what Norwegian law says. In other words, child protection makes a simple matter, very large, heavy and complicated. So it is now with me and Manglerud Polti, here distorts the truth. There are of course Christianity persecution by evil and wicked people who really should have been caged together with Jan Aage Torp, Ansgar Braut and Torodd Fuglesteg. What Torp has written about me verbally is far heavier than what I have written and spoken against him. Takes you to Norway's two worst and ugliest web roll, so they live in a separate world. Which is a thousand times more "criminal" than what I've ever written and spoken! The greatest villain of all, Jan Aage Torp should long since been stripped of all their children had been up child protection and well. But now it's too late, can only hope, believe and pray that the kids get a sizeable compensation from the state for lost childhood, it deserves the fair! I know a case personally, the so-called "glass girl." Here I could have written so much when CPS has a degree done such a poor and miserable job. In fact, here they have done does not hurt worse. But much, much worse. Do not look to attack child welfare as my primary task, if needed. Therefore, we have not written so much about child protection on the Heavenly blog, but some smådrypp going there now. Such as here!